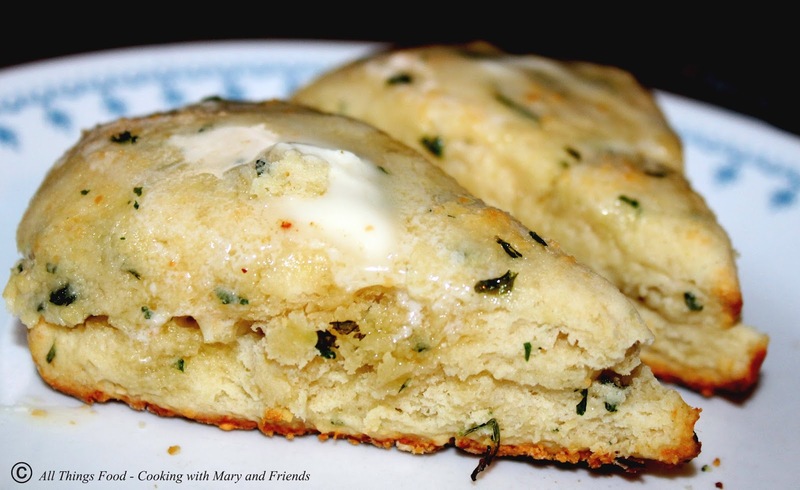 Traditional Irish Scones are usually cut in wedges, and can be savory or sweet. Originally, scones were made with oats, shaped into a large round, scored into four or six wedges (triangles) and griddle-baked over an open fire (later, a stove-top). With the advent of oven baking, the round of dough was cut into wedges and the scones were baked individually. 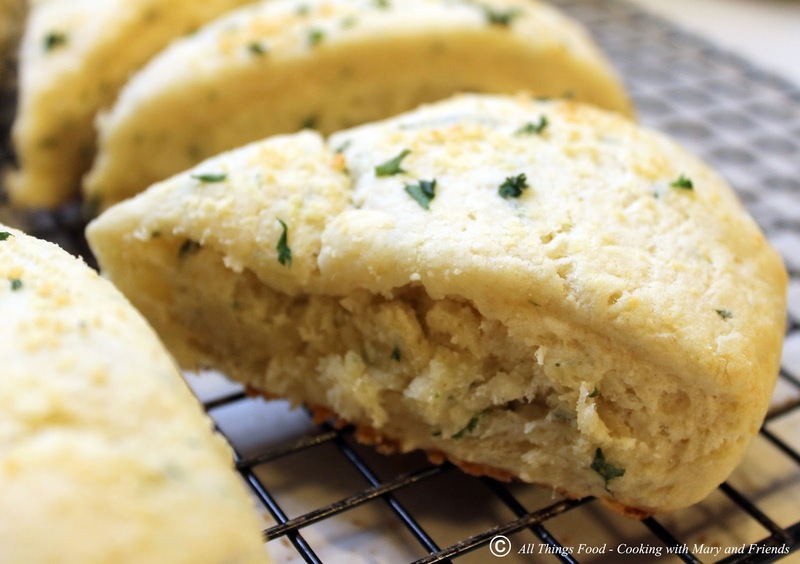 Today’s scones are quick breads, similar to biscuits. They are traditionally made with wheat flour, sugar, baking powder or baking soda, butter, milk and/or eggs, and baked in the oven, both in the traditional wedge form and in round, square and diamond shapes. 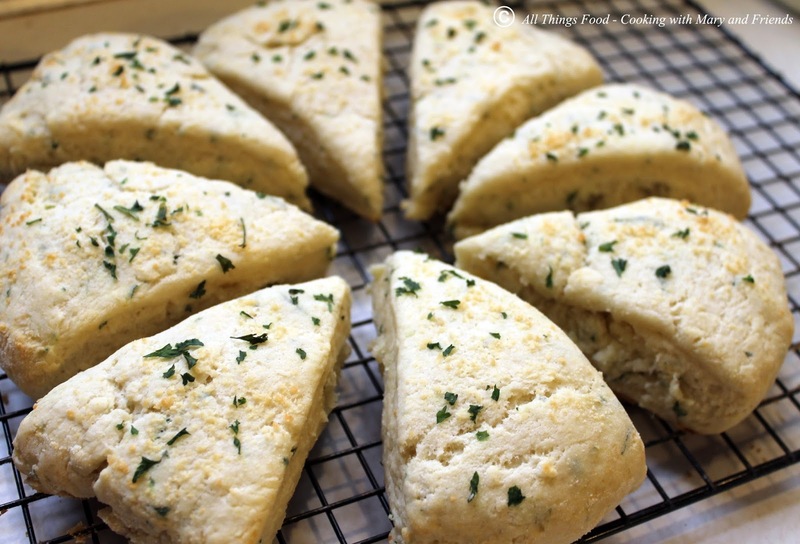 These savory scones are best served hot with lots of butter, or for a delicious flavor boost, serve them with garlic butter or roasted garlic and olive oil ... oh my goodness ... delicious! They take just minutes to whip together and 12 minutes to bake ... easy any time of the week. Stir together the flour, baking powder, sugar, salt, parsley flakes and Parmesan cheese in a mixing bowl. Use your fingertips, or a fork, to work the butter into the dry ingredients until the mixture just holds together, and mixture resembles coarse crumbs. Working the mixture as little as possible, add a scant 3/4 cup milk and stir until it forms into a soft, slightly sticky ball. Place the dough on a very lightly floured work surface. Using a floured rolling pin (or use your hands to pat it out), gently roll the dough to a 1-inch thick circle. Slice the dough into 8 triangles with a floured knife and cut out the individual scones. Spread some butter on top of the scones, and sprinkle tops with more Parmesan cheese and parsley flakes. Arrange the scones on a lightly greased baking sheet. Bake 12 minutes or until scones are barely browned. Remove from oven and transfer to a cooling rack. Serve immediately with butter, garlic butter, or roasted garlic and olive oil.